Location: Nara City, Nara Pref. Todaiji, a temple complex in the city of Nara in Nara Prefecture, was built in the year 743. At that time Buddhism was at its height, and served as a state religion. 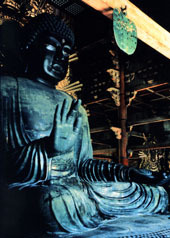 The best-known relic at Todaiji Temple is its Daibutsu, a colossal statue that, with 15 meters (49 feet) in height, is the world's largest gilded bronze Buddha. 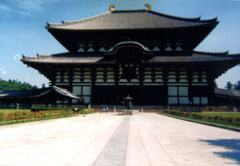 It is housed in an all-wood building, the Daibutsu-den, 48 meters (157 feet) in height, the largest wooden building in the world. Within the precincts of the temple, aligned along one-kilometer north-south and east-west axes centered on the Daibutsu-den, are an array of other buildings, including halls and storehouses, seven of which are National Treasures. By virtue of being one of the major historical temples in Japan, Todaiji Temple also possesses many valuable cultural artifacts. More than 20 of these Buddhist statues and other works of art are National Treasures. The repository for them, Shosoin, lives up its name of the Treasure House of the World. Since it was built in 749, the Daibutsu has been repaired and renovated after damage incurred by earthquakes: even its head has fallen off once. The base of the statue that remains today dates from the 8th century, while the upper portion, including the head, was largely recast in the second half of the 12th century. Tragedy also befell the buildings housing it, especially the flames of war. After one burning in the second half of the 16th century the Daibutsu stood unsheltered for a century until the current Daibutsu-den was built in 1692. The most recent Daibutsu-den built in 1709, although impressive, is a shadow of the original structure, the width being about 30 percent shorter. Also built around the middle of the 8th century, the original Shosoin, which is an architectural treasure in itself, served as the repository for the temple treasure. It is made in the Azekura style, a log-house construction that is often seen in old storehouses: the walls, intersecting at corners, are built up of hewn logs laid horizontally on top of each other. Shosoin safeguarded a heritage of around 9,000 different objects that date back to the 7th and 8th centuries, and most of them are well-preserved, so they can be attributed and accurately dated. Numerous articles were presented from overseas, especially from Persia, China, and Korea. The artifacts give a flavor of the cosmopolitan culture of China in the T'ang dynasty (618-907), when there was contact between the civilizations of Asia along the Silk Road (the overland trade routes from China to the Mediterranean in premodern times). It is for this reason that Shosoin's significance extends beyond Japan and that it is called the Treasure House of the World. Photos: (Top) The Great Buddha of Todaiji Temple ((c) Eisuke Ueda); (middle) Daibutsu-den, the pavilion that houses the Great Buddha, is the largest wooden building in the world (Nara Prefecture).